Home > 12 volt LED Dome Lights > FriLight 8777 (no switch) Nova LED Dome Light, 12 volt-24 Volt (10-30vdc). Recess Mount. Choose soft Warm White 3 Way LED, bright Cool White LED, soft Warm White LED, Red, Blue, or Bi-Color LED. 6 bezel choices. Optional Spring Mount Clips. 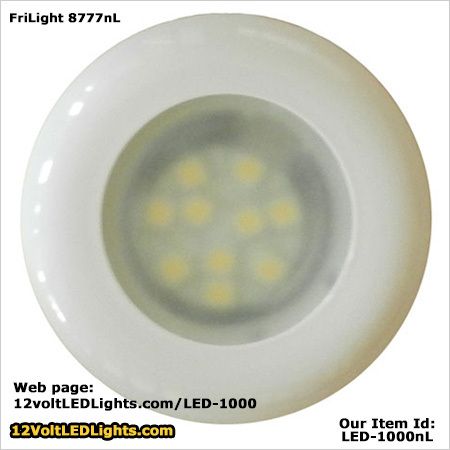 FriLight 8777 (no switch) Nova LED Dome Light, 12 volt-24 Volt (10-30vdc). Recess Mount. Choose soft Warm White 3 Way LED, bright Cool White LED, soft Warm White LED, Red, Blue, or Bi-Color LED. 6 bezel choices. Optional Spring Mount Clips. Note - this is a plastic fixture. 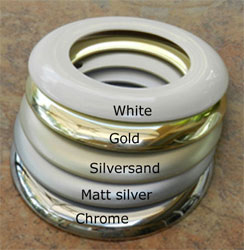 White, Chrome, Gold, Silver Sand (champagne), Matt Silver, Beige. Free Shipping - order today! The FriLight 8777nL is a plastic light fixture with frosted glass lens and NO switch. Same fixture is available with a switch here: Frilight 8777sL. Recess-mount low profile 12 volt/24 volt LED light includes energy efficient Bee Green LED Bulb with fuse and transient suppressor to protect against current overload and voltage spikes. Comparable light output to 25 watt Incandescent Bulb or 12 watt Halogen (warm or cool white LED). Warm White (soft white), Cool White (bright white), Red, or Blue. 1. Initially turns on secondary LED color for night comfort. 2. Turn off/on to change from secondary to primary white light. power off for approximately 7 seconds....... then power back on. *** Choose a 3 Way LED Bulb. Alternate between brightness levels by toggling power off, then back on. Switch must be inline (on fixture or wall mount). Switch NOT included. With a wall mount switch you can control an entire bank of lights having the 3-way bulbs operating in unison. 1. Initially turns on High. 2. Turn off/on to toggle to Medium. 3. Turn off/on to toggle to Low. 4. Turn off/on to toggle to back to High. Dimmable with our EF1206 LED Dimmers. I ordered 4 of these lights 190 lumens, with the spring mounting clips. Very easy install and very bright. One of the lights did not work, but the great staff ensured I got a replacement light in a very timely manner. They also sent a label for return postage. The new light worked great and I'm very impressed. I would highly recommend these lights and this company. The next time I need lights, I'll definiately order from 12voltledlights.com again. Compact. Bright. Everything I had hoped for. Highly recommend. Very easy install with the spring clips. The multiple bulb choices is a help and I put the bi-colors in so I can navigate at night. FriLight 8777 Nova LED Dome Light with Toggle SWITCH, 12 volt/24 Volt(10-30vdc). Recess Mount. Choose soft Warm White 3 Way LED, bright Cool White LED, soft Warm White LED, Red, Blue, or Bi-Color LEDs. 6 bezel choices. Optional Spring Mount Clips. Copyright 12VoltLEDLights.com. All Rights Reserved. eCommerce Software by 3dcart.